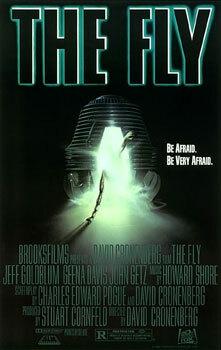 Cronenberg’s version of The Fly was recently adapted as an opera. The idea is not quite as ridiculous as it sounds. Summary: Seth Brundle is a quirky young scientist experimenting with teleportation. His machine is almost perfect, but it cannot transport live subjects. He invites journalist Veronica Quaife to follow his progress in teaching his machine to “love the flesh.” They soon fall in love, but a night of drunken jealousy drives Brundle to teleport himself, unknowingly trapping a housefly in the machine with him. The two are fused together at the genetic level, and Brundle begins to mutate into a creature that is both man and fly. Veronica must watch as the man she loves slowly loses his humanity. When The Fly was released in 1986, critics immediately drew comparisons to the AIDS epidemic. Seth Brundle’s debilitating mutation happens gradually, the svelte physique of Jeff Goldblum bloating with tumors, his face breaking out into sores, his body parts withering away as his own DNA consumes him. In his commentary for the film David Cronenberg mentions repeatedly that he wanted Goldblum’s character to remain articulate throughout the transformation. In Charles Pogue’s original screenplay, Brundle the scientist lost his ability to speak halfway through the film, communicating only through his lab’s computer. Cronenberg rewrote it so that Brundle retained his words. All the better to hear a beautiful mind narrate its ruination. But Cronenberg never meant the transformation from man to fly to be a stand-in for AIDS. He saw Brundle’s affliction as the betrayal of the flesh that accompanies all disease, of aging’s inexorable breakdown. At 95 minutes, The Fly is a sleek bullet of a film, circling around three main characters, the action contained by a handful of locations, predominantly Seth’s warehouse/lab/apartment. Its setting and sparse cast are ideal conditions for its metamorphosis into a stage production. Does its pathos elevate it to opera? According to its critics, no. Not having seen the opera myself I cannot say if Cronenberg’s opus to flesh gone mad makes for quality theatre. But if Fly failed onstage it was not for lack of good source material. The film is one of Cronenberg’s few features to garner mainstream acclaim, even winning an Academy Award for Best Makeup. Roger Ebert lamented that Jeff Goldblum was not nominated for a Best Actor. Horror and Sci-fi, he opines, are generally overlooked by the Academy. Much has been made of Goldblum’s performance in the film, and rightfully so. The actor portrays an intelligent man shattered by his hubris, and brings into the monster that he becomes a unique physicality (Cronenberg says other actors he approached were afraid of being lost under the rubber). Less often do I hear praise for Geena Davis, who plays Veronica Quaife, but it is she who truly grounds the piece. Goldblum and Davis had been dating when the film began and share an obvious and touching chemistry. Limited as its cast is, The Fly actually rushes their initial courtship. But the actors play off each other so well that we don’t wonder why. Now that I’m older, the creature effects strike me as no less gruesome, but the movie instills a new fear, that of abandonment and disease. Veronica and Seth do love each other, but as Seth’s condition worsens, Veronica’s love is useless, and torn by her fear and despair. What’s worse, she learns that she is pregnant with Seth’s child, and has no way of knowing if it was conceived before or after his genes were altered. For those turned off by gore, the movie will not entertain. It is a squeamish affair from beginning to end. But it is a touching film, one of Cronenberg’s most compact and emotional. It is a tragedy in the classic sense, a drama of human suffering, supported by great performances and grisly movie magic. It’s also just a great old-fashioned monster movie.